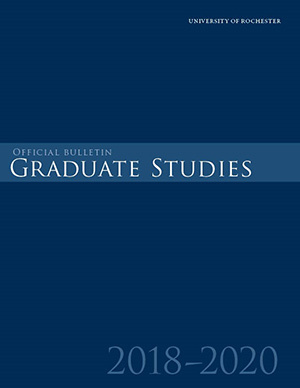 The University of Rochester's Graduate Studies Bulletin for 2018–2020 is offered here for download in Adobe Acrobat format. Please note that when downloaded (rather than viewed in a browser), the Graduate Bulletin PDF is bookmarked for your convenience. Clicking on the Bookmark tab in Acrobat Reader (on left side of document window) will reveal the bookmarks. Simply clicking on a bookmark will then take you to that section. The Table of Contents page also has links, allowing the document to be navigated quickly, and e-mail and Web address links in the PDF file are functional (e-mail links will be activated through whatever e-mail preferences you have set up in your default Web browser).